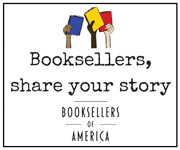 Promotional terms are visible to logged-in ABA Bookseller Members only. “An arresting, fiery book that’s ambitious in its aims, an inherently metaphysical novel that illustrates a singular worldview with confidence and verve. And it’s all done with a focused, original voice." “The Hazel Wood is flawless, fully realized, and gorgeously written. It has brilliant plot twists, a sweet story of love and friendship, and complex family drama. It seems to have sprung fully formed from the pen of an author at the top of her game, not a debut novelist. This is the book everyone’s going to be reading." “‘Astonishing’ is the perfect description for this book, which follows Leigh from America to Taiwan, where she meets her grandparents for the first time after her mother’s death. I was stunned by the beautiful and engaging writing in this book; the story consumed me from start to finish. It’s hard to believe that this is Emily X.R. Pan’s debut novel, especially with the perfectly executed deep and complex themes. It will definitely be a favorite among both adults and teen readers!